Scheider wants to leverage ZF's deep and diverse product portfolio. 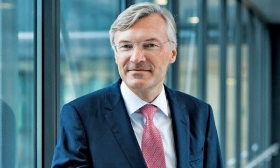 New ZF Friedrichhafen CEO Wolf-Henning Scheider's biggest question after fewer than 40 workdays at the supplier is: "How do we push this forward?" He wants to leverage ZF's deep and diverse product portfolio. "No one else has what we have," Scheider said. ZF produces everything from driveline and chassis technology to active and passive safety solutions. Scheider, 55, became CEO on Feb. 1 replacing Chief Financial Officer Konstantin Sauer who served as ZF's interim CEO after the departure of Stefan Sommer in December amid boardroom disagreements over the supplier's expansion strategy. Scheider believes ZF is heading in the right direction. He is particularly bullish about future ZF's future in the plug-in hybrid sector. The company already supplies a plug-in hybrid transmission based on its eight-speed automatic gearbox to Audi, BMW and the Volkswagen brand. "Plug-in hybrid will be a great technology for the next 10 to 20 years," Scheider told journalists in Friedrichshafen Wednesday on the eve of the company's annual financial results conference. He foresees ZF consistently doubling its production capacity for e-components in the coming years. When asked how he's settling into his new hometown after spending much of his 30-year automotive career in the Stuttgart area working for Robert Bosch and engine components maker Mahle, Scheider said he has been in his new house for less than three weeks. Despite the break-neck start to his ZF career, Scheider can see himself getting very comfortable here because three of his passions are sailing, hiking and skiing. Considering that Lake Constance is around the corner from his office and there are multiple skiing and hiking options within a short drive, Scheider might have found a perfect place to be for the next decade. ZF ranks No. 2 in the Automotive News Europe ranking of the top 100 global suppliers after Bosch at No. 1.